What Part Does LED Lighting Play In Cubicle Design? Cubicle LED lighting design is fast becoming a key factor in effective workflow. An office with good lighting is one that provides each employee with a balanced distribution of light across their monitors and work surfaces. Eye strain and poor lighting tend to be very common complaints of office workers due to a trend to reduce reliance on artificial lighting. While many studies have proven that natural light lifts employ morale and saves on overhead costs, the reality is that few office spaces are designed such that every worker has a sufficient or equal access to natural light. Cubicle led task lighting can offset this deficiency and restore even illumination throughout the workplace. Adjustable controls allow workers to raise or lower led light levels to achieve optimal levels of illumination. LED light uses only a fraction of the energy required for incandescent and fluorescent lighting sources. This translates to not only an abundance of light within individual cubicles but also an abundance of savings at the end of the quarter. While cubicle led lighting, has yet to equal the invigorating effect that sunlight has on the human mind and body, it nevertheless represents a vast improvement over harsh overhead fluorescent lighting. There have been many health studies conducted on the effects of fluorescent overhead and cubicle task lighting. These studies have found that fluorescent lights cast a glare on computer monitors that is very bright in places and contrasted by shadows in others. This contrast overworks the focusing muscles in the eye, causing eyestrain—and even migraine—headaches in many workers. Cubicle led task lighting is a much softer, warmer form of lighting that distributes evenly across desk surfaces and monitors without blinding glare. Because it is easily dimmed or raised at will, led task lighting also allows each worker to adjust light levels according to individual need. This helps further reduce office lighting costs by allowing workers to manage their own individual space with energy saving task lights that require far less power than overhead fixtures. LED cubicle lighting has consistently received a much higher approval rating than previous generations of fluorescent task lights. Cheaper fluorescent’s used to flicker at high rate of speed that bypassed the notice of the conscious mind but tended to agitate the subconscious mind. Many people would develop anxiety after prolonged exposure to fluorescent lights, even though this flickering was far too fast for the eye to actually “see.” This issue has since been resolved by LEDs that use diodes, rather than electrified gas, to emit light. LEDs do not flicker and are much gentler on the eyes. 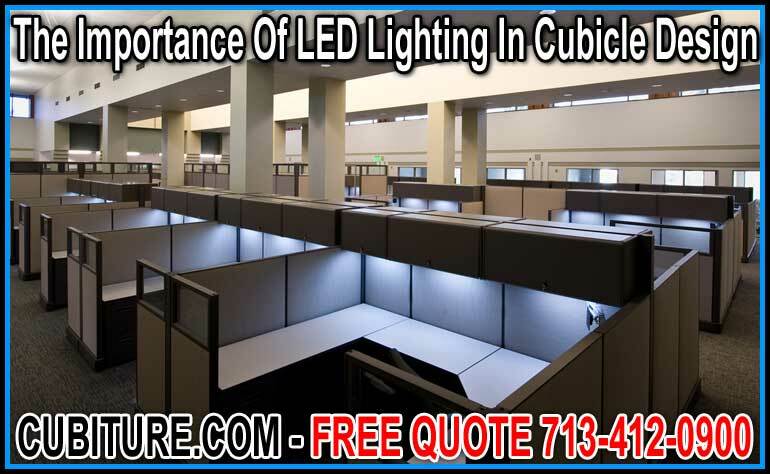 The cost of cubicle LED lighting will vary based upon the size and positioning of task lights. While many cubicle makers mount task lights to the bottoms of overhead storage bins, we take a more custom approach to interior lighting when it comes to workstation design. We build cubicles to support specific task completion requirements, and we choose our task lights with ergonomics foremost in mind. The energy savings of LEDs makes it possible for customers to buy the very best cubicle task lights on the market and recover their investment through consistently lower electric bills and improved office production. Call Cubiture now, and ask for Jerry to receive a free space plan CAD Drawing.